Sport climbing is neither so what is Aid Climbing? So today I went aid climbing, yesterday I was working. Really I wanted to get into the mountains but the snow level is still very low and it would have been a horrendous slog. I therefore convinced Ryan (who planned a day of sleeping on the couch) to come and climb the monkeys face with me. The monkey face is graded 5.8 A1 and while i dont usually climb Aid routes i thought it would go pretty easily. (for the non climbers Aid is basically pulling on the gear, or in this case bolts that are in the wall for protection and involves lots of things I never usually use such as little portable ladders called “etriers” and a whole host of techniques I have never learned. The photos should show exactly how cl0se the bolt were but it still felt kind of strenous. It was great to just be out and laughing at each other followed by a trip home past the pizza shop that sells 24 inch pizzas, it really was a good day. I have also spent a lot of time on the deschutes river recently for work which is awesome but is a very cold river flowing through the desert. I really feel the need for some trees and mountains but hey it might happen soon. 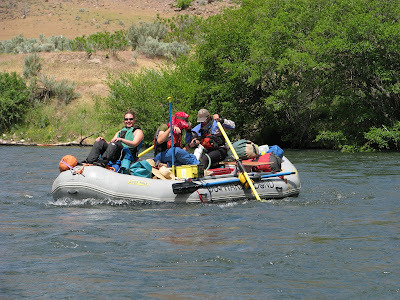 Tommorrow is my other day off before another 25 days in the field so I am off to kayak the metolious river. This could be highly amusing for my friends as it has been a very long time since I kayaked whitewater. Below- the monkeys face. the aid pitch goes up the left dark side and a climber can just be seen two thirds of their way up it. 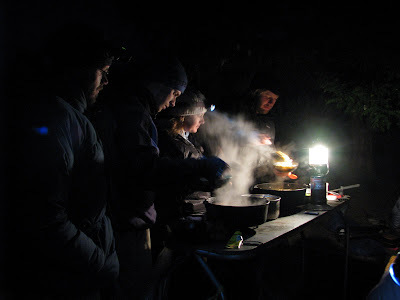 Ryan seconding the Aid pitch and Dave with a freshly baked foccacia on the river. 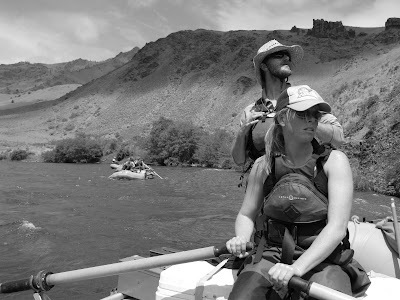 One of the 4 gear boats on the Deschutes – Jess in the princess seat with Kellen and steve at the oars. 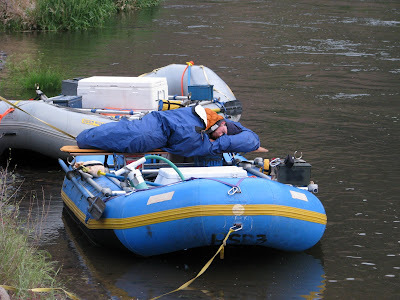 Kellen asleep on one of the four gear boats – early morning on the deschutes.